View all Kik Messenger chat conversations. Get access to any photos, videos or audio files sent through Kik Messenger chat and saved on the target phone. All Kik Messenger chat conversations are uploaded to your online TheTruthSpy control panel which you can access from anywhere with an internet connection. Are you tensed because you feel that your spouse is cheating on you? Now it is time you to unhide all the conversation made on Smartphone of your spouse. Start monitoring your spouse today so that you can know he/she is cheating you or not. But to spy kik messenger messages and chats of another messenger, you will need a spying application by the help of which you can monitor your spouse Smartphone. The spying application namely the truth spy is best for this purpose, and this software is designed mainly for spying. Also, the updated version of this application is compatible with various devices like iOS, Android, Samsung, Smartphone, etc. How to spy kik messenger messages? Do you think your spouse is hiding chats in kik messenger? If you wish to spy kik messenger messages, then the best option is to download any spy software program like TheTruthSpy. TheTruthSpy is genuine as well as worth considering for Kik Messenger spy. You can use this software for spying messages, shared photos, and other contents easily within few minutes. That is how you are going to spy your spouse kik messenger chats using the TheTruthSpy. Once you download and install the application, you need to log in. After it, you will be able to use TheTruthSpy for spying. Using this spying software the content shared, video, photos sent and received will be uploaded to your account from the targeted cell phone. The process of spying will take place quickly, and you get notification quickly. TheTruthSpy has all those features that help in spying, and it gives all the relevant information about the target. Remote control– you can control the cell of the target person through your phone, it will work as a remote. You can block some apps on their phone which you don’t want them to use. To use this, you must have an account on truthspy. Both phones must be synchronized to communicate with the each other. Save and sync- login to your account. In the setting option, go to sync and click on save and sync now options to synchronize server and target. Get GPS- go to GPS history and click on “GET GPS NOW.” Now you will get the location of the target phone. SMS command– through SMS you can control the target phone. You can hide or unhide the TheTruthSpy icon. Remove all the data of the phone and turn on the ambient recording, Wi-Fi, reboot, wipe a device, turn on the GPS, remove history call, SMS, auto answer feature, etc. You can control the phone completely by sending SMS to the target cell. Not this, but you can track almost every activity of your spouse from their call details to kik messenger chats. TheTruthSpy has some features that you will not get in any other spy app that is in the store. It can record the calls, messages, events, history of the phone and much more through its following features. GPS tracker– it is an interesting feature which tells you where your spouse is right now and where he/she went in last few days. The tracker will record the history of their recent and previous location and send them to your control panel. SMS spy– now whenever your spouse sends or receives messages on their mobile you can also read them. 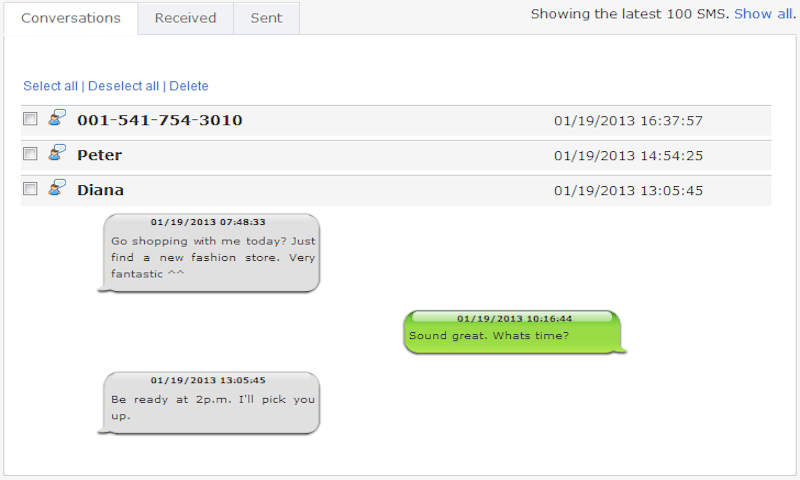 The app will send you the recorded messages, and in this way, you can spy kik messenger chats and other phone messages. Call recording– does your spouse talk to someone at the late nights, and this creates doubt in your mind? Hear their conversations through this call recording feature. When he/she is on the call then the microphone of the target cell will turn on automatically, and their chat will be recorded, and a sound file will be sent to your phone. Ambient voice recording– record the live sound of the surroundings to know what is happening around the victim. Click “START” on the control panel and listen to the vicinity. Have any idea where they are right now and what is happening around them by hearing the conversations about the person around them. WhatsApp spy– if your spouse has uninstalled the Kik messenger then you can’t spy kik messenger chats. But don’t worries WhatsApp is the standard chatting app that everyone uses and TheTruthSpy can spy WhatsApp conversations also. Social chats monitoring– other than WhatsApp you can see all their social media photos, profile, videos, and posts. We all know that how popular social media platform is and all the conversations and activities take place there. Hence to find out more about the target person monitor the social sites they use. TheTruthSpy will give benefit you in all ways and you can see whether you are being deceived or all your doubt is just useless thought of your mind. As said it offers you many benefits, so know what advantages you will get. Catch cheating spouse– one most important benefit is that you can catch your non trustworthy partner. Merely doubting on your spouse is just waste of your time and giving unnecessary stress to yourself. Rather use truth spy and spy kik messenger chats and make your doubt clear. Employee monitoring– no one is trustworthy especially if you are working in an organization then you will meet with peoples who can do anything to make their profit. Your employee may cheat you and share your secret to the competitors. Monitor their activities and catch them red-handed with the help of TheTruthSpy. Parental control– parents are so much concern about their kids because they stick to their smart phones till the late nights. This app is useful for parents, and they can control their kid’s phone using TheTruthSpy. Read their messages and chats. See what they watch online and where they go and what they do with their phone. And if they use Kik messenger spy easily without touching their phone and read their chats. Back up and find lost phones– keep all the data and chats safe on the target phone and if you have installed the app on your cell then back up all your data. In case the target person has lost the mobile phone then you can find it. All that we have discussed till now about the features and benefits, but you may be thinking that how to download it. Another question that comes, what if it does not support iPhone and works only on android then how will you spy on your spouse. Don’t worry TheTruthSpy operate on every platform and it’s not hard to download it. Go to the official website that is http://thetruthspy.com and there you will see two options. One for the android users and other for the iPhone users, choose your device and click on the download button. Change the settings to hide the app from the target mobile. Go to settings and turn off the security. To install the app, you must permit by pressing “OK” button. The app will automatically start downloading. Next step is to make an account so that you will get information of the other device. After that sync the server and target device so that you can control the mobile of your spouse. Remember to agree on the terms and policy of the app to spy kik messenger. If you click on disagree button, then the app will not download on the device, and you will have to go through the whole process again. Once you download, don’t forget to hide the app otherwise the target will know that someone is tracking its details and he/she will uninstall the app. Conclusion- after reading all the above information you must be very well aware of TheTruthSpy and know how to spy kik Messenger chats. The app has features that are useful in spying and function efficiently to provide you all the details that help you in spying. Till now thousands of user has taken advantage of this app, and their feedback is positive. In no way, the app will ruin your plan, and it supports you in the best way. Although there are many spy apps you can find but TheTruthSpy is at the top of all the above. That is true because of its new and advanced features that work smoothly and does not stop functioning in between. All that you need is to download it and use the internet connection should be good otherwise you may face the problem. It is easy to spy kik messenger and use TheTruthSpy to come out from this terrible situation where you remain continuously in a dilemma about your cheating spouse. Now, give them full proof evidence about their lies they said to you and make them realize that they are not doing right with you. TheTruthSpy is all your guide and friend in helping you in this terrible situation, and it will unhide everything.